To make Your stay in a Pallet Hostel comfortable and homely, fully equipped kitchen with dining area and TV at your disposal. At your disposal are two refrigerator, electric stove, microwave and washing machine. On-site free high-speed Wi-Fi. 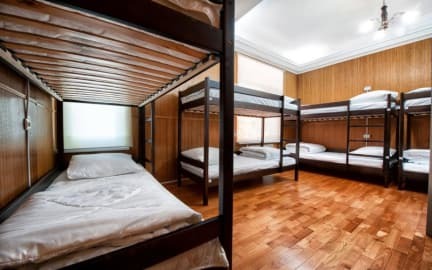 Hostel situated on Viacheslava Chernovola Street 10, 01135, Kiev, Ukraine. Just close (2 min walk) to be non-stop supermarket ATB. The convenient central location of the hostel allows you to easily explore the major sights of Kiev. Pallet Hostel offers comfortable rooms. Instantaneous boiler provides hot water 24 hours a day. At the reception, you can always take the use of a hairdryer, iron and ironing board. Payment upon arrival be cash, credit cards. Taxes not included - 1.00%. Pros: clean nice place, good value for money, not far away from a metro station and railway station. Cons: the reception closes at 12; arrivial after that time not possible. Everything you need when chosing hostel kind of sleeping :) 10 min from Lukianivska metro station. Calm place to stay. Big and comfortable kitchen. Shower was not in good condition, but was able to wash yourself :). Okay hostel, decent for Kiev. The other guests were very friendly, though there isn't a good common area to hang out. The kitchen, however, is really nice. I think there is only one shower which seems kind of absurd... Staff was kind of rude to me when I arrived and unfriendly during my stay -- I was only there for 1 day so hopefully the other staff members are better. We get there by uber but it was very hard to find the hostel in the night. The hostel board should be bigger may be lightened. May be one more shower would be great. Thats all. Бракує системи вентиляції, у кімнаті смерділо як у маршрутці. А загалом, не поганий бюджетний варіант переночувати. Despite the language barrier, staff was very nice and helpful. Value for money is great considering how cheap the rooms are, even for privates. However, the location is terrible. It's a 25-30 min journey by public transit to Maidan (city centre square). I wouldn't recommend taking the bus as they fill up pretty quickly. The other option is the subway, which involves a 5 min ride, but walking 10-15 min at EACH end. All in all, however, a good place to stay for budget conscious travellers. I can’t say I enjoyed this hostel at all. The WiFi kept cutting out and there are only two mouldy showers for the whole place. The worst bit though is that you are not given a key to get in so you need to be buzzed in every time. Needless to say the staff are not happy if you want to go out and experience some amazing Kiev nightlife, they want you back by 23.00. Kind of ruins a weekend holiday. I’ve stayed at Kiev Central Station Hostel before, it is soooo much better! !